The Tampa Bay Lightning have signed forward Nikita Kucherov to a three-year contract that carries a reported annual value of $4.766 million. The team made the announcement on Tuesday. The signing essentially solidifies what many people already know: the Lightning are serious contenders. General manager Steve Yzerman has made some terrific moves over the last while and the signing of Kucherov to such a bargain is another example. The 23-year-old scored 66 points for Tampa last season, including 30 goals, and he led the team in post-season scoring with 19 points. In 45 playoff games over the past two seasons, he had 42 points. The Lightning came within two wins of the Stanley Cup two seasons ago and came within a win of making the Final last season, so the pieces are in place to drive this franchise to glory once more. And the team is young enough and signed to contracts that are smart enough, so that suggests at least two or three more years of possibility for Tampa Bay. 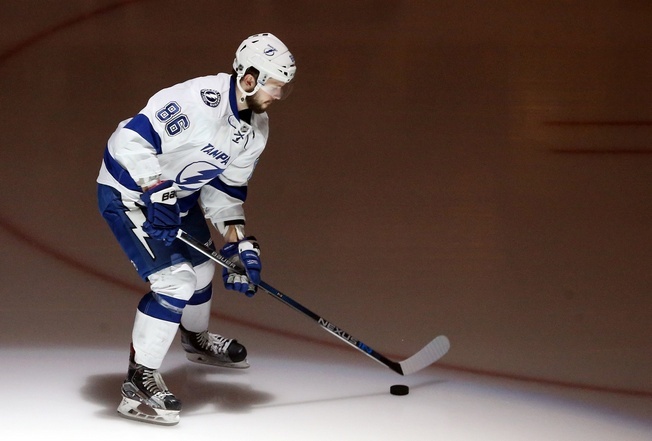 Consider the bargains Yzerman pulled for Steven Stamkos and Victor Hedman just a while ago. Stamkos is one of the greatest players in the modern game and the Lightning inked him to an eight-year deal worth an annual cap charge of $8.5 million. And Hedman signed an eight-year extension that commences next season and carries an annual cap charge of $7.875 million. Both players could’ve made more on the open market. Both players wanted to stay in Tampa – and for good reason. Even Jonathan Drouin, who once asked for a trade after clashing with coach Jon Cooper, is fully in the fold. Time and time again, Yzerman has shown that he’s not the type of guy to panic. He kept a cool head with Drouin. He was patient with Stamkos. He made a smart deal with Kucherov. There are still some issues to iron out. Ben Bishop is a pending UFA, while Drouin, Tyler Johnson, Ondrej Palat, and Andrej Sustr are among the pending RFAs. But there are also options, even with just a scrap of remaining cap space. Yzerman has proven he has the knack for pulling off some clever trades and signing some prudent deals. While he has long dealt with an embarrassment of riches in Tampa, the time seems ripe for dividends among the Lightning.